As a call to action, or a look into the future, a Jaguars fan wore a custom Colin Kaepernick jersey Thursday night. Even before a dismal performance on Thursday night, Blake Bortles was probably not long for his spot as Jacksonville Jaguars’ starting quarterback. But he may not even make it to Week 1, with head coach Doug Marrone expressing disappointment and opening up an opportunity for backup Chad Henne to win the job. 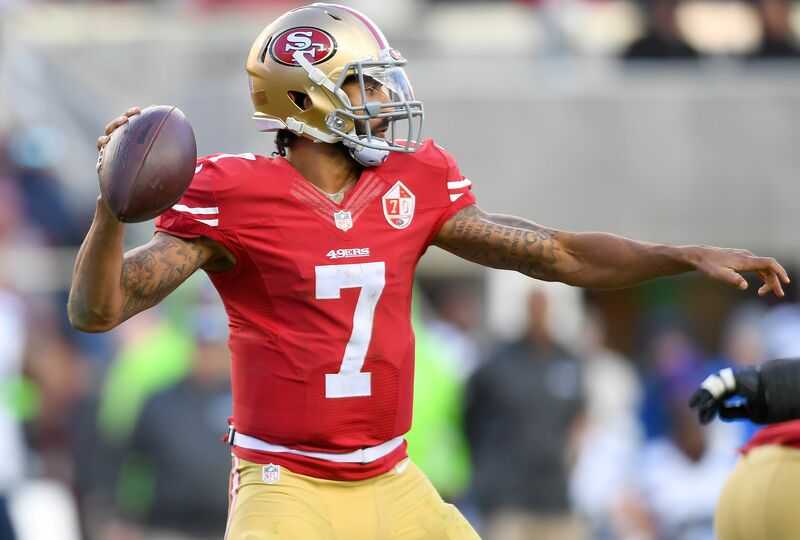 If he were with a team, Colin Kaepernick would surely be one of the top 64 quarterbacks in the NFL right now. But concerns about an off-field sideshow and fan reaction to his presence have kept him off a roster to this point. But not all NFL fans are against Kaepernick, or his off-the-field concerns. On Thursday night, with Bortles throwing scatter shot passes on the field during his four drives of action, a Jaguars’ fan was spotted wearing a custom Kaepernick jersey. As a hopefully well-intended statement on Kaepernick’s ongoing unemployment in the NFL, or a call to action for the Jaguars’ organization, wearing a custom Kaepernick jersey works. There has already been speculation the Jaguars could cut Bortles before the season starts, in order to avoid an injury that could lock them into $19 million next season. But there is also no legitimate competition for him in the fold right now, since Henne hasn’t throw a pass in a regular season game since 2014 and No. 3 quarterback Brandon Allen was inactive for his entire rookie season in 2016. That’s where Kaepernick comes in. He was fairly functional with the 49ers last season, on a very bad team, with 18 total touchdowns (16 passing), 468 rushing yards and just four interceptions in 331 pass attempts. He’s not a great traditional pocket passer, but he can’t be any more erratic than Bortles has been. If Marrone wants to run the ball a lot, with rookie Leonard Fournette as the centerpiece of the offense, Kaepernick can be a nice supplementary running threat too. If the Jaguars consider quarterback options outside of the current roster Kaepernick has to be on the list, if not at the top.